A friend or family member passing away is always a devastating emotional experience. And it becomes even more difficult when the family struggles to cover the financial loss of their loved one, as well. Paying for a funeral, alone, can cost as much as $20,000. And then there are the ongoing living costs of food and housing, which can be overwhelming, especially when children are involved. Unfortunately, I know from my own experience that many families are unprepared for what will become a reality one day for all of us. I want to chip in and help, and make it easy for others to do so, too, but there’s not always an easy way to make that happen. In some cases, a relative has stepped in to coordinate but, to be frank, I wasn’t always confident that all the money collected would make its way to the family. That’s where ALittleHelp.com can really offer a big hand. 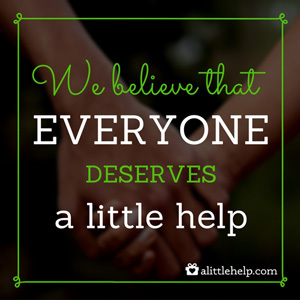 Sponsored by Legal & General America, a life insurance company with over 65 years of securing the financial futures of families, ALittleHelp is a community-funding platform dedicated to memorial funds that lets family and friends come together to help someone who has experienced the loss of a loved one. ALittleHelp doesn’t keep any portion of contributions—other sites can take up to 9% of your donation – the only costs are the standard Paypal transaction fee (2.9%) and per contribution fee ($0.30). Setting up a fund online is easy and only takes a few minutes. When you set up a fund, you can upload your favorite photos and share memories of your loved one. Then invite your network of friends and family to contribute funds to help relieve the financial hardships of the family. They can help out via credit card or Paypal, and provide their messages of condolences back to the family. They can even contribute anonymously, if they chose to do so. Visit ALittleHelp.com to set up your own memorial to help someone you know recover from the loss of a loved one. This is a sponsored post on behalf of ALittleHelp.